Fits Ford-New Holland 1000, 1100, 1200, 1300, 1310, 1500, 1510, 1600, 1700, 1710, 1900, 1910, 2000, 2100, 2110, 2120, 2150, 2250, 231, 2310, 233, 234, 2600, 2610, 2810, 2910, 3000, 3055, 3100, 3110, 3120, 3190, 3300, 3310, 3330, 3330, 334, 335, 340A, 340B, 3550 IND, 3600, 3610, 3900, 4000, 4100, 4110, 4200, 4330, 4340, 4410, 445, 445A, 4500, 4600, 4610, 5000, 5110, 515, 5200, 531, 532, 5340, 540A, 545A, 5600, 5610, 5900, 6000, 6410, 6600, 6610, 7000, 7100 and 7200. 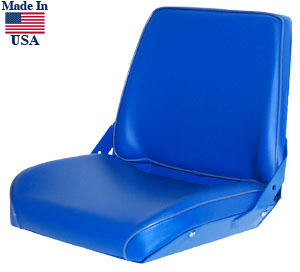 The Ford 107 Comfort Assembly (No Arms) is a quality replacement seat assembly for your Ford-New Holland tractor. Seat frame is steel. Seat and backrest have steel cores. Backrest has a 2" foam cushion and seat has a 4" foam cushion. Cushions are replaceable separately. Available in vinyl or fabric.